We understand feeding a family on a tight budget or being a struggling college student can make it hard to save money. You’re probably thinking that there is no way of organizing your food in your refrigerator can save you cash each week! Actually, how you arrange the items in your fridge can help you keep food longer minimizing unneeded trips to the grocery store. The best part is, these simple tips will only take you a few minutes to do and your family can help you maintain it! The number one thing to remember when storing food in your fridge is to ensure safety. Poor organization can lead to the risk of infection-causing bacteria. The biggest culprits are raw meats, like chicken, and raw eggs, which shouldn’t be sitting up against fresh snacks like apples or baby carrots in case of leakage. A good trick to remember which items go where are the foods that require the highest cooking temperatures should be stored at the lowest parts of the fridge. As mentioned above, store meats on bottom shelves, but also keep them in the back of the refrigerator where it is the coldest. This especially goes for fish and seafood because these cold temperatures will keep fish lasting twice as long. While the back of the refrigerator is the coldest section, the doors are the warmest part. The compartments on the doors are great for fruit juice, water, and condiments which don’t need particularly cold storing temperatures. The average American wastes so much food per year. According to the U.S. Department of Agriculture, over $500 worth of food is wasted per year! Produce tends to be the number one source of food spoilage and waste, so store your fruits and veggies right at eye level. Not only will you be reminded of what you have, but you may also grab an apple for a snack instead of binging on that day old slice of pizza. Don’t waste precious space on foods you don’t need to refrigerate. 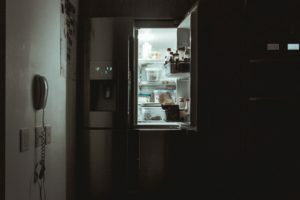 Common foods that tend to make it into the fridge like tomatoes, potatoes, lemons, limes, and bananas, should be stored at room temperature not only to save space but because otherwise take on odd textures or taste changes. Staying on a budget can be hard but we hope tips like these will help you save a little extra money. If you are still having a hard time making ends meet, there are a few different types of loans in Arizona that can give you cash– fast. Tio Rico offers the best car title loans Arizona has available, and we all know that this type of cash can help you get back on budget sooner rather than later. Getting a loan is easier than you think, too. You don’t need perfect credit to apply and our team of representatives can help you get through the process. Contact Tio Rico today to get started with your loan!